So tell me. Tempeh. Love it? Hate it? Tried it? I personally fall into the enjoy it category and these baked BBQ tempeh bowls are one of my favorite ways to put it to good use! But before we get into the nitty gritty details of this fantastic dinner recipe, let’s have a little chat about what on earth tempeh actually is (for those of you who might be unfamiliar). So, what is tempeh made of? Tempeh is a meatless form of protein that is made from soybeans, which are cooked, fermented and pressed into a patty. And while soy is a main component, many brands of tempeh also include grains, such as brown rice, barley, quinoa, millet, etc. <— Which is the type that I can find at my local stores. What does tempeh taste like? How’s it different from tofu? In terms of flavor, tempeh is a bit nutty and almost earthy, and has a hearty and sort of chewy / firm texture – i.e. pretty much the exact opposite of tofu – which is quite neutral in taste and soft in texture. Additionally, tempeh is less processed than tofu, which is something that I personally dig. I’ve found that as long as I flavor tempeh well (such as with BBQ sauce, fantastic marinades or any sort of delicious sauce) that I actually prefer it to tofu because of the texture. And baking or pan-frying are my favorite go-to methods for cooking it. Now! Let’s get back to these bowls specifically! What we have here today is basically a jazzed up kale salad base that is packed to the brim with roasted veggies – sweet potato, bell pepper and red onion – oh my! We have a super flavorful, slightly creamy dressing made with maple syrup, apple cider vinegar and a touch of tahini. It’s all finished off with a sprinkle of fresh cilantro and some finger lickin’ good BBQ baked tempeh. It’s healthy, easy and makes for great leftovers, making it most excellent for lunch or dinner. And it’s vegan, vegetarian, dairy free and gluten free, as long as you check the ingredients on both your BBQ sauce and tempeh. And when served up with some fluffy cornbread on the side? It’s dinnertime happiness. First up, let’s talk how to prep this dish to cut down on the total recipe time. Get everything going that’s cooking in the oven first and THEN slice / prep the kale, cabbage and salad dressing. You’ll have plenty of time to do this while the veggies and tempeh are baking. This will cut down the overall recipe time by about 15 minutes. If you find that your roasted veggies need slightly longer in the oven to get nice and tender, take out the tempeh after the 20 minutes and then just continue baking the veggies alone. I never needed to do this but all ovens will be a bit different. Be sure to use certified gluten free BBQ sauce if needed for your diet! Additionally, make sure that you check the ingredients on your tempeh – some brands do include grains which may or may not be gluten free! Let’s chat about the kale. You’ll need about 2 medium bunches to get the listed 8 cups. This may vary slightly just depending on their exact size. As far as the type of kale, either regular or lacinato will work. I personally prefer lacinato (which I find to be a bit more tender), but lately haven’t been able to find any at my local stores! And finally, you may have a bit of extra tempeh, just depending on the ratio of veggies to tempeh that you like! If you find that you have leftovers, it is fantastic in wraps / sandwiches / for topping other salads! You really can’t go wrong. 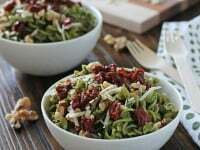 Additional Meal Bowl Recipes You Might Enjoy! Finger licking good baked BBQ tempeh bowls! This healthy dinner is packed with BBQ tempeh, roasted veggies, tender kale and a creamy dressing! Vegan & gluten free! Preheat the oven to 400ºF. Place an oven rack in the top third and another rack in the bottom third of the oven. Grease a 9x13 inch glass baking dish with nonstick spray. Next, add about half of the BBQ sauce to the bottom of the dish, then use a spoon to push it around so it coats the bottom. Place the tempeh in the pan in a single layer, then pour the remaining BBQ sauce over the top, using a spoon to evenly coat all the pieces. Set aside. Add the sweet potato, bell pepper and red onion to a large rimmed baking sheet. Drizzle with the olive oil, then sprinkle with the salt and pepper. Toss to combine then spread in an even layer. Bake for about 35 minutes on the upper rack, stirring once about halfway through, until all the veggies are tender. After the veggies have been baking for 15 minutes, add the tempeh to the lower part of the oven and bake for the remaining 20 minutes. Remove both from the oven and allow to cool slightly, about 5 to 10 minutes. While everything is baking, add the sliced kale to a large bowl and sprinkle with a pinch of salt. Use your hands to massage the kale – grab handfuls and gently scrunch. Continue massaging until the kale is darker in color and has reduced a bit in volume (this takes about 2 to 3 minutes). Add the cabbage to the bowl. In a small bowl, whisk together the olive oil, tahini, maple syrup, vinegar, salt and pepper until smooth. Pour into the bowl with the kale and toss to combine. Let the mixture sit while everything finishes cooking and cooling down. To the bowl, add the slightly cooled veggies and toss to combine. Taste and season with additional salt / pepper as desired (I usually add a bit more salt). 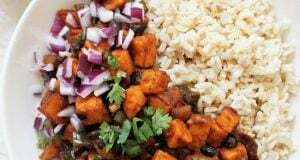 To serve, spoon some of the veggie mixture into a bowl and top with the BBQ tempeh and a sprinkle of fresh cilantro! Tempeh is definitely and acquired taste but I’ve grown to love it! Especially with a good BBQ sauce. These bowls look all kinds of delicious! I’ve never had tempeh and I’m afraid to try it because I can’t stand tofu. I’ve heard it’s not the same, but I think it’s the texture that I’m worried about? I think adding BBQ sauce to it would definitely make it better so I’d be down for trying this! I held out on trying it for a long time but I’ll say that I actually really prefer the texture to that of tofu – even my husband likes it which is saying something! haha And yes, you definitely need to flavor it well! I’m with you, I enjoy tempeh too! This salad sounds so yummy and nourishing. One of my favorite salads to get at a restaurant features tempeh, and I’ve been wanting to recreate it at home. Ooo you should! I’m always looking for new recipes with tempeh! I’ve never had tempeh before but I’m so intrigued to try it now! LOVE all that BBQ goodness you’ve got going on in these glorious bowls! Oh my!! This looks absolutely delicious! Yummy!! I adore tempeh! 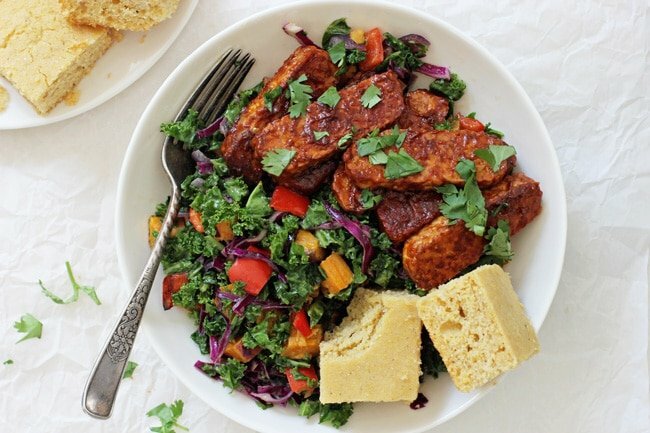 Your kale bowl with those bbq tempeh slices and roasted veggies look absolutely mouthwatering!